For many consumers, a prepaid card offers important advantages over credit and debit cards, including the opportunity to use a card regardless of credit or banking history, and the ability to pay with “plastic” without overspending or incurring debt. But some prepaid cards have been known to carry unpredictable fees that made them more expensive than users expect. In recent years, general purpose reloadable prepaid cards—those that can be funded (loaded) and used over and over to make purchases, pay bills or get cash at an ATM—have become much more popular. This growth has increased competition among prepaid card issuers and resulted in more card choices with better features and lower fees. There are now hundreds of general purpose reloadable prepaid cards to choose from. Some are much more consumer-friendly than others. Whether you are considering a prepaid card for the first time or you already have one and want to compare it to other options, this guide is designed to help you choose the best prepaid card for your needs. General purpose prepaid cards have many things in common with credit and debit cards. Like credit cards, prepaid cards carry the logo of one of the four major payment networks (Visa, MasterCard, Discover and American Express) and can typically be used to make purchases anyplace in the world that accepts cards from the same network. You also can use your card to shop online. A prepaid card that allows you to have your income direct-deposited, pay bills online or set up recurring payments can serve as an alternative to a bank account. Like a checking account debit card, you can use your prepaid card to get cash at an ATM. But prepaid cards are different from credit and debit cards in some fundamental ways. First, they are not a form of credit, nor are they tied to a checking account. Second, to use the card, you have to first “load” money on to it. This means that in most cases you can’t spend more than you have in the account and incur overdraft fees, and you can’t accrue debt or finance charges. 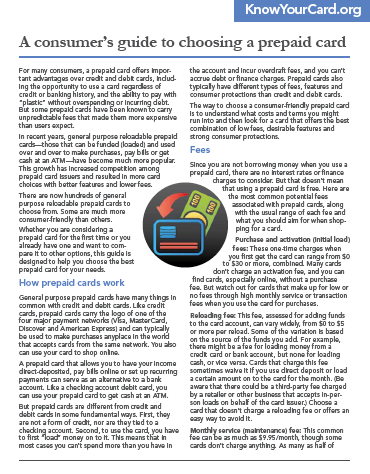 Prepaid cards also typically have different types of fees, features and consumer protections than credit and debit cards. The way to choose a consumer-friendly prepaid card is to understand what costs and terms you might run into and then look for a card that offers the best combination of low fees, desirable features and strong consumer protections. Since you are not borrowing money when you use a prepaid card, there are no interest rates or finance charges to consider. But that doesn’t mean that using a prepaid card is free. Here are the most common potential fees associated with prepaid cards, along with the usual range of each fee and what you should aim for when shopping for a card. Purchase and activation (initial load) fees: These one-time charges when you first get the card can range from $0 to $30 or more, combined. Many cards don’t charge an activation fee, and you can find cards, especially online, without a purchase fee. But watch out for cards that make up for low or no fees through high monthly service or transaction fees when you use the card for purchases. Reloading fee: This fee, assessed for adding funds to the card account, can vary widely, from $0 to $5 or more per reload. Some of the variation is based on the source of the funds you add. For example, there might be a fee for loading money from a credit card or bank account, but none for loading cash, or vice versa. Cards that charge this fee sometimes waive it if you use direct deposit or load a certain amount on to the card for the month. (Be aware that there could be a third-party fee charged by a retailer or other business that accepts in-person loads on behalf of the card issuer.) Choose a card that doesn’t charge a reloading fee or offers an easy way to avoid it. Monthly service (maintenance) fee: This common fee can be as much as $9.95/month, though some cards don’t charge anything. As many as half of cards that charge a monthly service fee reduce or waive it if you use direct deposit to reload, or if you meet a minimum monthly reload requirement. (Minimums can be quite high.) Many cards offer the option of a monthly fee or, for less frequent users, a smaller per-purchase transaction fee. Purchase transaction fee: This is a smaller fee—say, 49¢ to $2—that is charged for each purchase transaction. Some cards with these fees charge them only for debit (PIN) transactions or “credit” (signature) transactions, while others assess them on both types. Many cards offer the option to pay a per-transaction fee instead of a monthly fee—something that might make sense if you use the card very infrequently. Don’t pay both a monthly maintenance fee and a purchase transaction fee. If you choose to pay a purchase transaction fee, make sure there is a monthly limit (say, $10). After you hit that threshold, you won’t pay a fee on additional purchase transactions within the same month. Declined transaction fee: If you try to make a purchase without sufficient funds in your prepaid card account, and you don’t have overdraft coverage (see next section), the transaction will be declined. Not all cards charge this fee—look for one that doesn’t. ATM withdrawal fee: Many cards offer free withdrawals on specific ATM networks. Virtually all prepaid card issuers charge a fee (usually $1 to $3) for withdrawing money from an out-of-network ATM. In addition to your card’s out-of-network ATM fee, it’s likely you’ll pay a surcharge assessed by the owner/operator of the ATM. Avoid both fees by choosing a card that allows unlimited free in-network ATM withdrawals—they’re not hard to find. Also check if the card will allow you to get cash back with no fee when making a purchase at a grocery store or other point-of-sale. ATM balance inquiry fee: This fee, typically ranging from 49¢ to $2, is charged for checking your balance at an ATM. You shouldn’t have any trouble finding plenty of cards that allow free in-network ATM balance inquiries. Most cards allow you to sign up to access your account online so you can check your balance for free. Bill-pay fee: If you plan to use your card to pay bills online or set up automated recurring payments for monthly bills, look for a card that doesn’t charge a fee for bill payments—they’re out there. If you can’t find a card without a bill payment fee, choose a card that charges a relatively low fee compared to other cards. Funds transfer fee: If you need to transfer money to another cardholder, there may be a fee. If you plan to transfer funds regularly, look for a card that doesn’t charge this fee. Foreign transaction and currency conversion fee: It’s not uncommon for card issuers to charge a fee when you use your card internationally, though not all charge a transaction fee. If you plan to use your card outside the U.S., choose a card with lower-than-average fees in this category. Inactivity fee: You could be charged a fee if you don’t use your card for an extended period (typically three months or longer). The fee—both the amount and the period after which it is assessed—can range widely. For example, one card issuer might charge $2 per month after 180 days of inactivity, while another charges $5.95 per month after 90 days. If you think there might be periods when your card goes unused, consider this fee when shopping around. And make sure that the inactivity fee does not exceed the regular monthly service fee or the maximum monthly per-transaction fee limit. Many cards that assess an inactivity fee won’t do so if you have at least made a balance inquiry, an ATM withdrawal or a call to customer service once during the month (even if you haven’t made a purchase). Paper statement fee: Many, if not most, cards charge a fee to send you a paper statement—as much as $5.95 or more. But you can easily avoid this fee by checking your statements and account activity online. Don’t choose a card that charges a fee for accessing your account online. Customer service fee: You shouldn’t have to pay a fee to talk to a live customer service representative, but some card issuers charge for that. There are plenty that don’t, so shop around. Other fees are either avoidable or assessed so infrequently as to not be a significant factor when choosing a card—for example, a fee to replace a lost card or a fee to close the account (each of which can be $10 or more, though many cards charge less or even nothing). In addition to the types and amount of fees, the “transparency” of the fees is very important. Any card you choose should list all potential fees very clearly—check them before you buy. Because card packaging might not allow disclosure of all fees, it’s best to check the card’s website before you choose. Only by knowing exactly what fees you could be charged can you make a well-informed choice. While overdraft coverage might sound like a desirable feature, it is best avoided on a prepaid card. First, being able to take your balance into negative territory defeats one of the greatest benefits of using a prepaid card: the inability to spend more than you have. Second, there is a high cost to overdraft coverage on any banking product, including prepaid cards. The fee to overdraw your account can be $15 or much more each time. An overdraft option is not common on prepaid cards, but it does exist. Choose a card that doesn’t allow overdrafts and that doesn’t charge a fee if one inadvertently occurs. Some prepaid cards now offer rewards programs and features such as free roadside assistance. If you want these extras, look for a low-fee card that offers bonuses and perks. Beware of cards that offset rewards and extra features with high fees. If you like to conduct your banking using a mobile device or computer, choose a card that offers a mobile app (software for your phone or tablet), online bill-pay, email/text message alerts and other digital tools to help you manage your money, reload your account, pay bills and stay on top of your balance. There are a few prepaid cards that offer a savings feature. But for building up your savings, a better option would be an account at a credit union or a basic bank savings account. This would help you establish a relationship with a banking institution, keep your money out of easy reach (avoid impulse purchases!) and may offer a better interest rate. Learn if you are eligible to join a credit union at www.aSmarterChoice.org. If you want to share the account with a spouse, partner or children (allowances), some card issuers offer sub-accounts. These can also be used for budgeting purposes. There may be a fee for using sub-accounts, so compare fees on different cards. Prepaid cards typically are sold online or through retailers. Before purchasing a card at a retailer, visit the card issuer’s website to get the full list of terms and fees, which are too lengthy to fit on card packaging. (Some larger retailers may have brochures or flyers outlining the terms on the cards they sell.) Purchasing and using a card is a legal contract. The terms and conditions should include everything you need to know about how to use the card to avoid fees, take advantage of features and benefits, exercise your consumer rights and protect your privacy. Don’t purchase a card without first comparing your options and reading through fee schedules and terms of service. Judge the card to some extent by how clear and complete its disclosures are, how easy information is to find and how helpful its representatives are. “Test drive” the card’s customer service by emailing a question and calling the toll-free number. When comparing fees, make sure you consider what the card will cost you the way you intend to use it. For example, if you rarely or never travel outside the U.S., then foreign transaction and currency conversion fees shouldn’t factor heavily into your cost analysis. Likewise, if you only plan to use the card for three or four purchases a month, then a card with a mandatory $10 monthly maintenance fee won’t be as attractive as one that gives you the option to instead pay a low per-purchase fee. Determine whether you’ll be able to easily avoid fees. For example, choosing a card that allows you to get cash back with no fee when making a purchase at a grocery store or other point-of-sale means you can avoid out-of-network ATM withdrawal fees. If avoiding fees will be difficult, consider a different card—one that makes it easier to keep costs low. Be sure that you can reload the card conveniently (online, through direct deposit or in person at an agent location) at no cost and that there are free in-network ATMs near your home or work. Card comparison websites make it easy to shop around. But be aware that not all comparison sites reveal all available options in their search results. It’s best to use a few sites, and then narrow down your list to a few cards for a side-by-side comparison. For specific questions about a particular card, contact the issuer at the number on the card or on the card website. An “Employee’s Guide to Payroll Cards,” a free publication from Consumer Action, helps workers at companies offering payroll cards to determine whether a card is their best option for receiving wages, understand how to avoid card fees and know their rights. The Consumer Financial Protection Bureau (CFPB) is tasked with creating and enforcing rules governing financial products and services, including prepaid cards. To find general information, visit the CFPB website and search for “prepaid cards.” You can also file a complaint against a card issuer or financial institution online or by calling 855-411-2372. This publication was created by Consumer Action with a grant from Visa Inc. It is part of the Consumer Action/Visa Inc. educational project Know Your Card.